Above each entrance to the building there is a shutter housing and a piece of metal projecting outwards. These are the guides and mechanisms to operate what were one corrugated rolling shutters. Given their lack of artistic finish, they were believed to have been installed after Gaudí. Today, thanks to this photograph published in 1911, we can date these shutters, which were more common in industrial and commercial premises than in dwellings, to around 1910. The first documented image we have of the shutters is slide No. 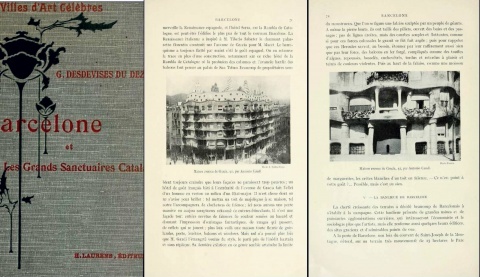 56, which features in Album d’architecture moderne à Barcelone: Collection de 70 planches, published in Barcelona by the Parera publishing house in 1911 (Bibliothèque de Matériaux et Documents d'Art Espagnol.) The edition is in Spanish and French. The second photograph is by Lucien Roisin Besnard (L. Roisin collection) (Paris, 1884 - Barcelona, 1943), an industrial photographer, editor and owner of the hugely popular Postales Roisin shop. The images clearly show the shutter pulled down. 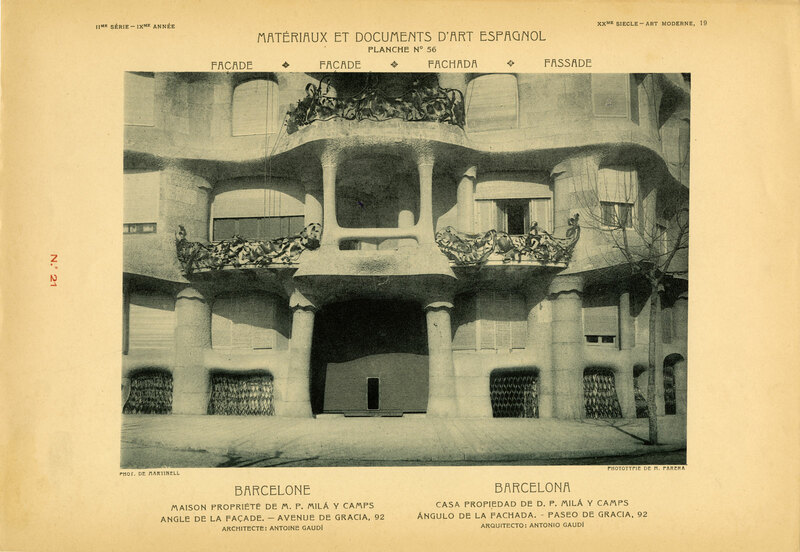 The third image of the shutter is found in Barcelone et les Grands Sanctuaires Catalans, a prestigious tourist guidebook of Catalonia (H. Laurens 1913, Paris), profusely illustrated with 144 engravings and written by Georges-Nicolas Desdevises du Dezért (1854 –1942), a historian, novelist, poet, literary critic and Hispanist. The guidebook forms part of a fifty-volume collection entitled "Les Villes d'Art célébres", of which one is given over to the Spanish cities of Cordoba, Granada and Seville, and the other volume to Barcelona and Catalonia, containing twelve chapters and 172 pages and covering cities, towns and noteworthy places such as Barcelona, Girona, Sant Joan de les Abadesses and Ripoll, Vic, Montserrat, Manresa, Lleida, Poblet, Santes Creus, Tarragona and Tortosa. 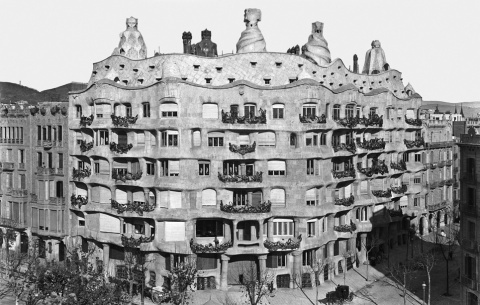 This volume has two photographs of La Pedrera, one of them is the same photograph that appears in Album d’architecture moderne à Barcelone; the second shows the entire main façade and was taken by one of the most prolific postcard printers of the time, Àngel Toldrà Viazo (Photo A. Toldrà Viazo). But no-one like Mr Gaudí has gone so far in the desire for singularity, the resolve for lofty uniqueness and inimitability. His latest creation in this genre seems to brush the limit of the colossal. Imagine a rock sculpted by giants. From the rough stone, they have carved pillars, hollowed out orifices and galleries; there is not a single straight line, only gently undulating curves, as if for these titanic forces the granite were clay; then, drive home the fact, that these Herculean artists know how to astound both for their finesse and for then strength, as if were necessary: wrought iron balconies, convoluted like clumps of seaweed, thrust, battered, entangled and twisted cheerfully and dyed with violent colours. And at the summit of the rocky outcrop, in the manner of a bunch of daisies, the white crests of a ceramic rooftop. Is it not to your liking?... Perhaps, but it is to him. (pages 71-72).